One of the great things about living in the 21st century is the proliferation of great study Bibles that are now available. David Jeremiah’s Study Bible is the result of 40 years of study and 4 years laboring specifically on this Bible. The results are terrific. It’s a Bible that is chalked full of theological insights, practical applications, and a plethora of helpful information to help you grow in your understanding of, and application of the Scriptures. Easy-to-read type; Book Introductions; 8,000 study notes; 100’s of sidebars on 100’s of topics; Over 50 articles on Doctrinal issues; Helpful illustrations; Answers to tough questions; Wise insights; Words of Jesus in red-letter print; Colorful charts, tables, and maps; A massive topical index and concordance; and a Harmony of the Gospels; available in King James and New King James Versions. One of the best features can be found online or on your phone. There are places throughout the Bible to scan your phone or go on the web for even more articles and helpful tools by Dr. Jeremiah for Bible study. 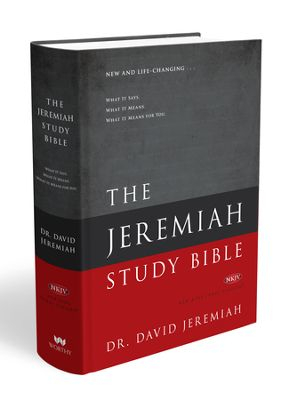 You can get a great introduction to this Bible by watching a video from Dr. Jeremiah at http://www.JeremiahStudyBible.com. I purchased this Bible for my parents and my wife, and so far we are all really enjoying Jeremiah’s insights and notes. I personally like the balance of theological explanation and practical application in the study notes. This study Bible will only help you better apply Paul’s exhortation to Timothy: “Be diligent to present yourself approved to God, a worker who does not need to be ashamed, rightly dividing the word of truth” (2 Timothy 2:15). I highly recommend this Study Bible for your personal growth in the Lord.